In a surprise move, Transport Minister Phil Twyford yesterday announced that the New Zealand Superannuation Fund – often referred to as the “Cullen Fund” after former Finance Minister Michael Cullen – would take over the financing and delivery of the City Rail Link project under downtown Auckland. Mr Twyford justified the decision by saying that “the NZ Super Fund and their Canadian partners CDPQ Infra have made an unsolicited bid to combine construction of the City Rail Link with light rail. SPV PPP BOOT means that both projects will be delivered at no initial cost to taxpayers and ratepayers, with only ongoing operational costs of $1 billion a year for the next 200 years.” Mr Twyford added that this approach was modelled on the Milldale infrastructure funding agreement for the new suburb north of Auckland next to Millwater and the future Millvile and Millmill. NZ Super Fund Chief Executive Matt Whineray confirmed the agreement, noting that this “public public partnership” SPV BOOT HIF arrangement would deliver great returns to the Fund in the years to come, but that their Canadian partners proposed a redesign of the City Rail Link project. Mr Whineray explained that as part of the deal, the route would be changed “…to serve Wynyard Quarter, the University and the Hospital through a 5 kilometre long tunnel, as opposed to the previously designed much shorter tunnel.” He added that “…a longer tunnel that’s more expensive to construct provides a better long-term return to the Super Fund”. CDPQ Infra could not be reached for comment, but it is understood that they came up with the new route while playing ice-hockey in Montreal. When questioned about the route change, City Rail Link Limited Chief Executive Sean Sweeney sighed heavily before saying “…much like the light-rail project, politicians seem happy to throw years of investigation and design work away just because local business and infrastructure lobbies as well as a Canadian pension fund have convinced them charging an interest premium is the same as free money”. Mr Sweeney was last seen banging his head against a concrete wall in the nearly complete but now unnecessary tunnel under Albert Street. Auckland Councillor, and long-time NZ Herald hero, Mike Lee was highly supportive of the changes. “It’s common sense to make the tunnel longer, because it means that Auckland’s rail network is getting bigger than it would have been under the previous proposal“. Mr Lee also said he was pleased to hear that the new design would be future proofed by including junctions to allow a number of new rail corridors to be built “This means that Auckland’s rail network can continue to grow and it is preferable that all lines make use of this new tunnel“. It is understood some of new rail routes being planned for stage two of CDPQ’s plan will include trains serving the North Shore, inner west, northwest, central isthmus, east Auckland and the airport. With so many routes sharing the tunnel, each line will run every 20 minutes at peak time and to increase capacity, stations are now being designed for 15-car trains. As part of the plan, multi-storey park and ride buildings, each with space for thousands of cars, are expected to be built at every station. The changes to CRL’s financing, delivery and route appear likely to severely affect the timeframes for its completion. But Minister Twyford seemed unfazed by this saying that “construction will definitely start next year, probably some time just before an event I won’t name that is typically held every three years“. Auckland Transport are interested in using the nearly completed and now un-needed Albert St tunnels for a cycleway with CEO Shane Ellison noting “this is the perfect opportunity for us to deliver cycling infrastructure that is completely separated from cars and can be done without sacrificing car parking”. Greater Auckland was asked for comment, but did not reply before the deadline. Their members were last seen accompanying Mr Sweeney into the Albert Street tunnel. I fell for this one. After the last week of Brexit and Trump Mexico fantasy news the unbelievable reality of this proposal is just part of the new abnormal. The bit that really got me though was Phil Tywford making an announcement about transport. Now that is unusual. Phil’s announcement skills should seriously be used by AT for all in-train and on-platform announcements. I heard Hone was to give the te reo announcements some bite. It had me for a little bit and then suddenly I saw the light (or, perhaps, the date). When I came back to it just now and read more of it I decided that eventually it got quite obvious… and also much more biting. No mention of the Newmarket Station to Parnell Station shared path ? At last, common sense prevails! Underground high speed rail from Britomart to Sydney would be nice, too. Must feel good to let all your true feelings out in one big post! How come no one seems to have said that it was an April Fools? And also, any idea what the Heralds was? The CRL story, perhaps? Sounds like the kind of thing they’d do. And I note in this morning’s print Herald that Bernard Orsman has had an epiphany and discovered at last that the CRL is the best thing since sliced bread……………….it will take 17 minutes off the journey from Henderson – the capacity will be 54,000 passengers per hour – it no longer matters that it will be much more expensive than earlier envisaged (like every motorway) because it is going to be so much bigger and better etc. etc. Apart from a wee reference to driving down Albert Street an unbelievable change of attitude from this previously ‘agin it’ reporter. Oh great, looks like I’ll be able to catch a train from Garnet Road station. Hope there’s plenty of parking out front, will be perfect for park and ride. How can it be an April fools when it included light rail financing? The sad part is that tomorrow there will still be a chance the Cullen Fund and their Canadian partners will get to own Dominion Road. 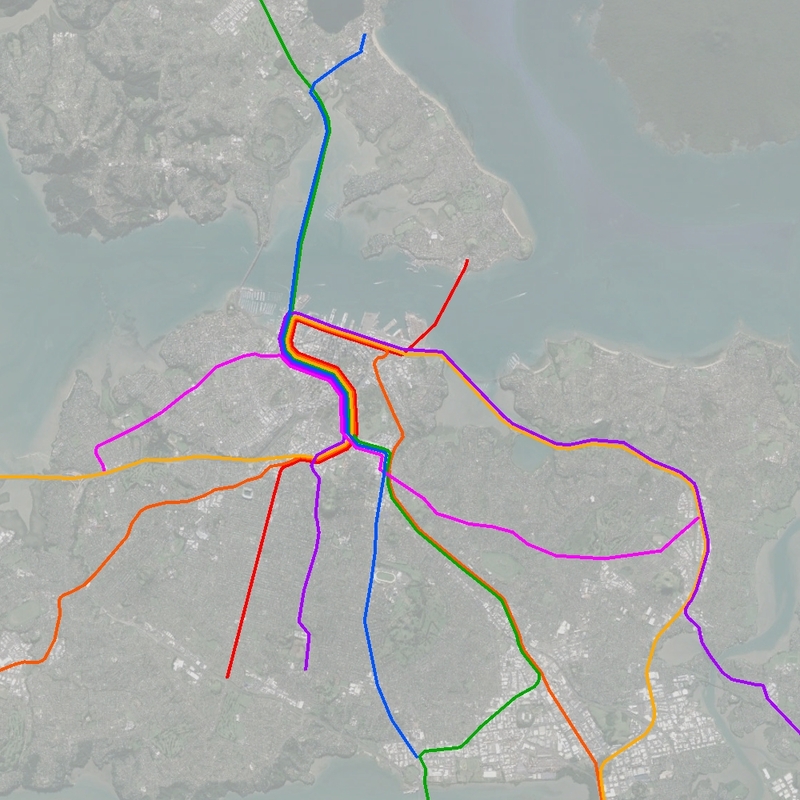 I have often mused about connecting Takapuna via Devonport to the Eastern Line at Orakei. This would be another opportunity for Dr Sweeney to consider. Biased reporting. You’ve ignored the Herald’s transport expert Mike Hosking’s opinion that it’s the fault of cyclists; overlooked Bernard Orsman’s scoop about the PM’s lack of confidence in the transport team (OK that referred to the previous government, but nothing has really changed); failed to quote Judith Collins’s considered view that ‘It’s another Twyford stuff up’; and finally, garnered no expert opinion from the AA, the people who really count in this city. I’m so disappointed. I’m surprised that they didn’t announce the involvement of German consortium Unglaublich Grossbusfabrik GMbH in the procurement of the new rail vehicles. I believe this was actually prepared by their sister company, Wahnsinniger Zug GmBH. Given the last few years I was expecting an April fools. The Herald has two more interesting CRL articles this morning. One refers to the $30M “saving” of not building the Bereford entrance, and the other warns of the Crossrail systems problems. Whaaatt!!! CRLL’s boss, Sweeney, now says they are tracking for a late 2024 completion of CRL. Wasn’t the original 2023 date pushed forward 3 months when Fletchers baled? Now it’s just quietly moved to end 2024? Is somebody extracting the Michael here or can we expect CRL completion will keep slipping outwards to 2030? This is not an April fools jape. I think the joke was suggesting a one year delay in the tendering process was going to result in just a three month delay to the project being delivered. The late 2024 timeline sounds much more realistic. Ok, so pushing out the completion date doesn’t seem to matter a jot. No urgency on this project, should we just mark tentative completion for 2026 with the strong possibility of 2028 or later if a contractor or subbie runs into problems. No rush eh? It’s reality, a delay of a year in tendering a project will likely result in a year’s delay to the completion of the project. Is it ideal? Of course not, but it is the reality with large projects of this type, look at the issues they have had with Crossrail in London. That project is a sobering reminder that we may well not have CRL even by 2024. Sounds too good to be true for NZ super fund. Its actually not that ridiculous when you think about it. $1 billion a year on a $10 billion plus investment + operating costs. oh yeah baby, that would work good. You can’t be serious! Is it really April 1st already? I look forward to the April Fools post every year. This one is just as close to reality as all of the others. Great work. All the great artists are misunderstood. Or maybe it’s just not supposed to catch people out – in this case because there are enough people making it clear in the comments?